A question I get asked all the time is how do you know when you need to upgrade webhosts for your online store or blog? After all, my original cheap shared hosting, Bluehost, served me well for over two years until I switched over all of my sites to dedicated hosting at Storm On Demand. In fact, here’s a question I received this past week. Steve, Bluehost seems to offer unlimited domain hosting, unlimited storage and unlimited bandwidth. Why would you ever need to upgrade hosts if everything is unlimited? Am I missing something here? Absolutely! There is much more to it and I’ll try and explain to you the nuances between the different flavors of hosting below. Web hosting is a cut throat business. As a result, most webhosts will do whatever they can to entice you to sign up. So they’ll offer you unlimited accounts. They’ll offer you unlimited bandwidth and unlimited storage. But realistically, there is no way you are ever going to be able to take advantage of unlimited anything! First off, let’s address the unlimited storage. A long time ago, I signed up for a cheap webhost(not Bluehost) and decided to use the “unlimited storage” as a place to backup all of my family photos. And at one point I had probably over 400GB worth of files on my shared account. Everything was fine and good until one day out of the blue my shared webhost came knocking on my door. When I called to complain that it was false advertising to claim “unlimited storage”, the webhost replied that all web storage must pertain to your website and/or web account and that all of my large full resolution photos did not apply. Bottom line, I had to remove most of my photos from my account. The other exaggerated claim that many shared webhosts like to make is that you are allowed unlimited bandwidth with your account. But what they don’t tell you in the fine print is that your account is only allowed a certain amount of CPU time. So in the event that your website is getting too much traffic and uses too much of your server’s processor cycles, your website will either get throttled or shutdown altogether. As a result, there is no way in hell that you’ll ever be able to utilize your “unlimited bandwidth” even if you are getting a ton of traffic to your site. The amount of CPU time that you actually receive is heavily dependent on your shared webhost and is usually something I ask about whenever I signup. 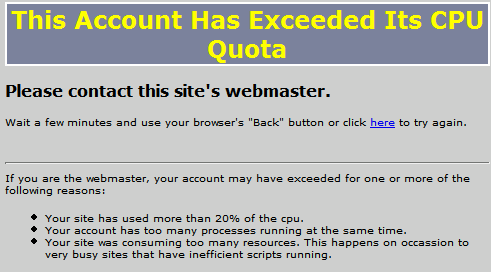 And in my experience, they way webhosts deal with overages is all over the map. I’ve used shared webhosts that will completely shut your website down indefinitely when you exceed your quota until you contact them directly. Other hosts like Bluehost will simply throttle your site for several minutes or so. Don’t get me wrong though. Shared hosting is an incredible value for what you pay for. And the webhost that I recommend, Bluehost, is still an excellent option that costs only $4.95 a month. Personally, I would not go any cheaper than this because there will be hidden tradeoffs that you will not know about until your website starts going down. The reason that I like Bluehost is because they don’t stuff a ridiculous number of sites on every box. They have great uptimes, reasonable CPU limits and they offer “Simple Scripts” which allow you to quickly install popular website applications onto your server. But at some point in time as you start getting more and more traffic, you will eventually need a more powerful and a more stable computer server to work with. The main downside to shared hosting is that there are a bunch of other websites running on your same server. As a result, your website can slowdown when other sites on your same box are using too many resources. Now even though good shared hosts like Bluehost will throttle these rogue sites down, often times your website will still slow down regardless. In the world of eCommerce, any slowdown can have extremely negative effects on sales conversions so it pays to offer your customers a consistently fast experience. If you constantly feel as though your website is sluggish and you feel like you are losing sales because of it, then it’s usually time to upgrade your hosting. The other more obvious way to tell that you need more powerful hosting is when you constantly trip the CPU limit that your shared webhost places on your account. This was the case with my online store. Back when my online store was on shared hosting, I used to trip the CPU limit at least once or twice a week. Losing even a single customer can be costly to your ecommerce shop. Once you’ve graduated from shared hosting, the next logical step is to rent your own server. From here, there are 2 basic options. You can signup for a Virtual Private Server (VPS) or get your own dedicated server. Here’s the difference between the two. With a dedicated host, you own the entire computer and you will be the only one using 100% of the resources. With a VPS, a server is split up into separate machines that all behave like a dedicated server. For example, the VPS provider that I currently use, Storm On Demand, partitions a single machine into many virtual servers and guarantees you a certain amount of resources. And the best part is that my account is more or less completely isolated from the other virtual servers on my machine so that there’s very little chance of my sites being affected by others on the same box. The advantage of going with a VPS over a dedicated server is price. Often times, a dedicated server starts at $200/month whereas you can usually find a decent VPS for $35/month. A VPS is usually the next logical step for most webmasters after shared hosting. 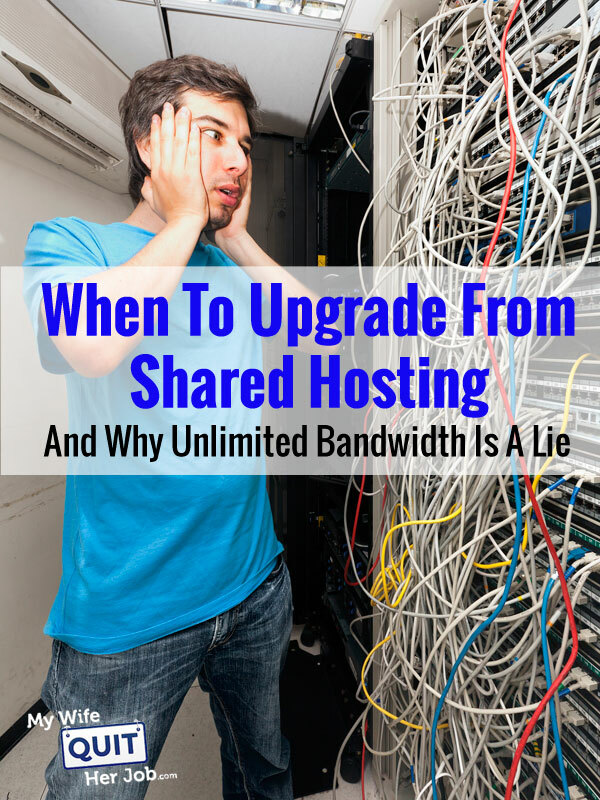 Ultimately, the decision to upgrade your hosting comes down to money. How much money are you going to lose if your site becomes sluggish or goes down? In the case of my online store, one customer lost was enough to pay for a whole months worth of VPS hosting so it was a no brainer. In the end, you need to gauge whether paying the extra money will end up being a net positive for your business. But honestly, given how cheap VPS hosting is these days, you would have to be making extremely little with your site to not justify an upgrade. After all, all it takes is one major outage and you’ll wish that your site was hosted on a more solid foundation. I always ask clients how comfortable they’d be having a “shared phone” for their incoming business line, or a neon sign that switched off after a certain number of people drove by on the street and saw it. False economies in webhosting, email hosting, site design and content development are some of the most basic mistakes that businesses make. They assign an intern to write the blog, somebody’s sister-in-law to answer email, and find a “free” website host. Then all they need is an AOL email address and they’re ready to go. I’m a professional content developer. (No, I don’t write web posts or FB messages for people — I’d have to charge too much.) But it’s sad to see how little thought business people give to something so important. I completely agree. Most people that I encounter online are very hesitant to invest very much in their business initially. But shared hosting is a great way to get started and it’s easy enough to switch later on. What is your opinion on dedicated cloud services such as AWS EC3, or Google App Engine versus the VPN and dedicated server route you mention? I ask because it seems at least on the surface that with something like EC3 you get the value added of having a dedicated server that you can scale up as needed, so that you pay only for what you use. The last time I checked their prices were fairly reasonable for the kind of bandwidth that most small businesses would use. Plus their control panel is hard to beat. I have often been intrigued with the flexibility of these services but wonder what you think given that you have to make these sorts of decisions daily. EC3 and App Engine are great platforms if you plan on scaling your business to potentially millions of users without the headaches. For my store, I don’t think it will ever get more than a few 100K visits a month but who knows? Shared hosting also depends on what other types of sites are on your box. If the other sites are traffic loaded, then they slow down the server tremendously. This will cause your site to load slow or not load at all. This is why hosts throttle. While the unlimited domains is usually true, the other parts are in fact just marketing gimmicks. Yep. Most shared hosts will throttle rogue sites quite liberally so most of the time, the slowdowns aren’t horrible. But it’s still light years slower than dedicated or VPS hosting. This reminds me of my Netflix usage years back. I was a heavy user and was a member of the 3-at-a-timie plan, and would average 10-15 discs per month. After a while, I noticed a pattern that after the 10th disc or so in any given month, it would suddenly take two days to receive any disc instead of the normal overnight delivery. Netflix later admitted that they were throttling high volume users, and ever since then, you realize that there is no such thing as true unlimited anything, especially if the price is that low. Thanks for this, Steve. This is actually I’ve been wondering about recently as my site just hit the 5k visitor / month mark yeaterday! About how many visitors did you have per month when you decided to make the switch? I realize that it may depend on the other sites on the server and everything (I’m on Bluehost), but Is there a number I should keep in mind to anticipate switching hosting services? Hey Allison. Congrats on your milestone! I don’t know what your setup looks like, but I think you still have a ways to go until you’ll need to upgrade hosts. I think I upgraded my blog at around 30K visits a month? I can’t remember exactly. Thx for the information. My knowledge about hosting and all of the intricacies continues to increase each day. What about Cloud Hosting services? Do you have any advice about them, as they seem to advertise a lot about being able to withstand sudden increases in bandwith usage, but other than that, I don’t really know what people who have used them think about them. And I find that I’m so distrustful with the Hosting Companies and their advertising (though I agree with you about Bluehost being a good one. I also enjoy being their customer). Thanks for the informative post Steve. I’m still on shared hosting but I always wonder when is the right time to switch to something better. If a VPS is only $35 a month and offers much better performance and site speed than it might make sense to switch, but I know so little about the technical side of things. I might hit you up with some more questions on skype as I do more research. There are no such “unlimited everything” in this world. Some way or other there would be some limitation. Is there a curious title i have seen here i know the author has done super job to done this article. some lovely lines and most important think that VPS hosting is the best hosting as i realize because its a 4 year i am using VPS hosting to run my particular project. shared hosting is also an great choice when we will manages multiple website in the same server then we can take this. thank you give your suggestion. I READ YOU ARTICLE REGARDING WEB HOSTING. IT IS REALLY INFORMATIVE AND USEFUL FOR WEB HOSTING. YOU HAVE PROVIDED SOME LINKS WHICH ARE ALSO USEFUL TO UNDERSTAND ITS CONCEPTS. THANKS FOR SHARING IT WITH US. Great post.This post is very informative and useful.I read your an article regarding web hosting.Thanks for sharing..!! !